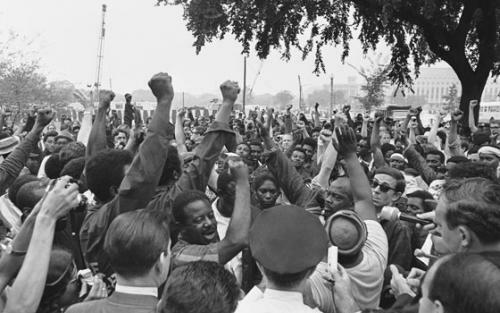 The Poor People’s Campaign (PPC) was created on December 4, 1967, by the Southern Christian Leadership Conference (SCLC) to address the issues of unemployment, housing shortages for the poor, and the impact of poverty on the lives of millions of Americans. Unlike earlier efforts directed toward helping African Americans gain civil rights and voting rights, SCLC and its leader, Dr. Martin Luther King, Jr., now addressed issues that impacted all who were poor regardless of racial background. Their immediate aim was to secure Federal legislation ensuring full employment and promoting the construction of low-income housing to raise the quality of life of the nation’s impoverished citizens. The SCLC planned a nationwide march on Washington on April 22, 1968, to focus the nation’s attention on this issue and particularly to pressure Congress to pass legislation to address the employment and housing issues. Unlike earlier marches, SCLC leaders planned the creation of Resurrection City, a giant tent city on the Mall in Washington, D.C., where demonstrators would remain until their demands were met. When Dr. King was assassinated in Memphis, Tennessee on April 4, 1968, movement leaders debated whether to go forward with the planned demonstration. They chose to continue the march with King’s lieutenant, Rev. Ralph Abernathy, as its new leader. The march date was postponed to May 12, 1968, though a few hundred people arrived in Washington on the original date. The first week, May 12-29, brought a wave of nearly 5,000 demonstrators. During the second week Resurrection City was completed. The protestors, people from a wide range of racial, ethnic, and socioeconomic backgrounds—Native Americans from reservations, Latinos from the Southwest, impoverished whites from West Virginia, as well as rural and urban blacks—came together and spread the message of the campaign to various Federal agencies. They also disrupted life in Washington to try and force the government to respond. At its peak, the number of protestors reached nearly 7,000 but still far short of the expectation of 50,000 people. The march was also marred by weather and leadership divisions. An unusual downpour of rain made the ground turn to mud causing the tents to weaken, and eventually forcing people to leave. Tension among the demonstrators themselves caused violent outbreaks and undermined the effectiveness of PPC leadership. The assassination of Senator Robert Kennedy, a presidential aspirant and one of the PPC’s principal supporters in Congress, on June 5, 1968, sealed the fate of the campaign. Resurrection City closed two weeks later on June 19, 1968.